Funeral services for Virginia Long, of Morris, formerly of Herman, will be on Tuesday, April 16th at 2:00 p.m. at Zion Lutheran Church in Morris with Reverend Reed Stockman officiating. A visitation will begin at 12:00 p.m. at the church on Tuesday until the time of the service. Burial will be at Summit Cemetery in Morris. 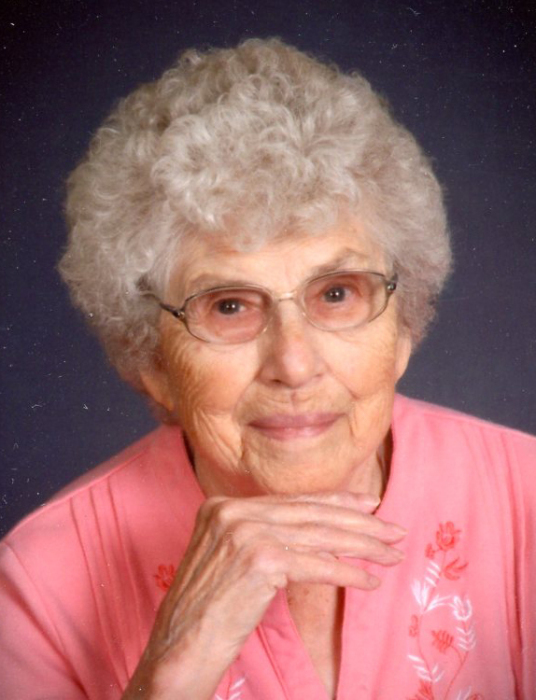 Virginia Clara Martha Hoefs was born on May 23, 1923 in Duerr Township, Lidgerwood, North Dakota to William and Anna Maria Wilhelmina (Willprecht) Hoefs. She was baptized on June 10, 1923 at Immanuel Lutheran Church and confirmed on March 21, 1937 at Holy Cross Lutheran Church in rural Lidgerwood. Virginia was raised and attended country school until the 9th grade in Lidgerwood. On June 27, 1943, Virginia was united in marriage to Adolph Long in Grant Township, near Lidgerwood. The couple moved to California before returning to the LaMoure, North Dakota area where they farmed for 15 years. In 1959, the family moved to Herman, Minnesota and purchased a farm, where they continued to live until their retirement. Retiring, in 1985, they moved to Morris. Adolph preceded Virginia in death on November 5, 2011. She continued to live in Morris and in 2018, she became a resident of West Wind Village in Morris where she lived until her death. Virginia was a member of Bethlehem Lutheran Church in Herman and after moving to Morris, Zion Lutheran Church. She was active in LWML and the Homemaker’s Club. Virginia has many talents – probably a necessity with a large family. She would bake bread every Saturday – 11 loaves – the amount that would fit in her oven and then would serve the family rolls for Sunday breakfast. Virginia was a great cook, especially fried chicken, and a baker, mock angel food cake with lemon filling was a favorite! She baked and decorated many birthday, baptism, confirmation, and wedding cakes. Virginia also enjoyed sewing, growing and canning vegetables, playing cards, going to church and bible study, and mostly, taking care of her large family. Virginia died peacefully on Wednesday, April 10, 2019, surrounded by family, at West Wind Village in Morris. Virginia is survived by her children: Shirley (Ernie) Frarck of Atwater, Charles (Karen) Long of Herman, Clarine (Stan) Meyer of Annandale, Joyce (Gary) Harding of Watertown, Sherman (Sherry) Long of Hoffman, Clyde (Brenda) Long of Herman and Barbara (Bob) Wentzel of Eden Prairie; 19 grandchildren: Robb (Amy) Carter, Annette (Fred) Williamson, Curtis Frarck, Janel (Steve) Statz, Carla Ritter, Jennifer Meyer, Torri Erickson, Susan (Colin Taira) Harding, Anna Harding, HollyJo (Shane) Wevley, Matthew (Liza) Long, Nathan (fiancé Shana) Long, Jacob Long, Braeden Long, Keaton Long, Ryanne Long, Danielle Stratmann, Justin Wentzel and Kayla Wentzel; 21 great-grandchildren; sisters: Iva Prudlik of Hankinson, ND and Lucille Smith of West Fargo, ND. Virginia is preceded in death by her husband, Adolph; parents; daughter, Diane Carter; son-in-law Bob Carter; brothers, Randy Hoefs and Wilbert Hoefs; sister-in-law Ethel Hoefs; brother-in-law, John Prudlik; and great-grandson, Jack Charles Ritter. Pedersen Funeral Home in Morris is in charge of arrangements.